Name Variation Harriet Annora Kendrick was also known as Kendrick. Married Name before 1873 As of before 1873,her married name was Lingscheid. Harriet Annora Kendrick was born on 11 January 1853 at Wisconsin. She married Anton Lingscheid, son of Anton Lingscheid and Elizabeth Stone Mueller, before 1873. Harriet Annora Kendrick died on 12 March 1896 at died 3 days after childbirth, California, at age 43. [S246] U.S. Federal Census 1880 U.S. Federal Census, by Ancestry.com, NA Film Number T9-0085 Page Number 475D. Name Variation Harriet Elizabeth Lingscheid was also known as Hattie. Harriet Elizabeth Lingscheid was born on 9 March 1874 at Iowa also reported as California. She was the daughter of Anton Lingscheid and Harriet Annora Kendrick. Harriet Elizabeth Lingscheid died on 4 February 1976 at age 101. [S245] U.S. Federal Census 1900 U.S. Federal Census, by Ancestry.com, ED184. Dwelling 50. Name Variation Anthony William Lingscheid was also known as Anton A.
Anthony William Lingscheid was born on 20 May 1876 at California. He was the son of Anton Lingscheid and Harriet Annora Kendrick. Anthony William Lingscheid died on 6 February 1933 at age 56. Name Variation May Juette Lingscheid was also known as Mary. May Juette Lingscheid was born on 18 October 1878 at California. May Juette Lingscheid died on 19 February 1909 at age 30. [S244] U.S. Federal Census 1910 U.S. Federal Census, by Ancestry.com, ED130. Dwelling 297. Name Variation Annora Ellen Lingscheid was also known as Nollie. Annora Ellen Lingscheid was born on 20 December 1885 at California. Annora Ellen Lingscheid died on 19 April 1904 at age 18. Hiram Joseph Lingscheid was born on 9 March 1889 at California. Hiram Joseph Lingscheid married Helen D. Tolley on 24 February 1919 LINGSCHEID/TOLLY--[Marriage license issued]--In San Francisco, February 24, 1919, to Hiram J. LINGSCHEID, 28, and Helen D. TOLLEY, 24, both of Red Bluff, Cal." Source: Sacramento Bee, 25 Feb 1919. Hiram Joseph Lingscheid died on 15 May 1938 at age 49. Married Name 24 February 1919 As of 24 February 1919,her married name was Lingscheid. Helen D. Tolley married Hiram Joseph Lingscheid, son of Anton Lingscheid and Harriet Annora Kendrick, on 24 February 1919 LINGSCHEID/TOLLY--[Marriage license issued]--In San Francisco, February 24, 1919, to Hiram J. LINGSCHEID, 28, and Helen D. TOLLEY, 24, both of Red Bluff, Cal." Source: Sacramento Bee, 25 Feb 1919. Frederick Robert Lingscheid was born on 15 July 1872 at Iowa. Anton Lingscheid died on 9 March 1896. He was born on 9 March 1896. Name Variation Mary Eleanor Bramberry was also known as Mary Elizabeth. Name Variation Mary Eleanor Bramberry was also known as Bamberry. Name Variation Mary Eleanor Bramberry was also known as Mary B. Married Name circa 1884 As of circa 1884,her married name was Burns. Married Name circa 1884 As of circa 1884,her married name was Byrne. Mary Eleanor Bramberry was born in November 1858 at Toronto, Canada. She married John L. Burns, son of Patrick Byrne and Anna Hullen, circa 1884 at St. Paul, Minnesota. Mary Eleanor Bramberry died on 19 August 1937 at Butte, Silver Bow, Montana, at age 78 Mary Eleanor Burns Obituary. She was buried after 19 August 1937 at St. Patrick's Catholic Cemetery (located on South Montana Street), Butte, Silver Bow, Montana. Mary Eleanor Bramberry immigrated in 1865. She had 2 with 2 living in 1900 children. She had 2 with 2 living in 1910 children. [S245] U.S. Federal Census 1900 U.S. Federal Census, by Ancestry.com, ED127. Dwelling 155. [S244] U.S. Federal Census 1910 U.S. Federal Census, by Ancestry.com, ED111. Dwelling 108. [S243] U.S. Federal Census 1920 U.S. Federal Census, by Ancestry.com, ED229. Dwelling 4. [S250] U.S. Federal Census 1930 U.S. Federal Census, by Ancestry.com, ED38. Dwelling 119. Name Variation Ann Elizabeth Burns was also known as Anna E.
Name Variation Ann Elizabeth Burns was also known as Byrne. Name Variation Ann Elizabeth Burns was also known as Annie. Married Name 1913 As of 1913,her married name was Anderson. Ann Elizabeth Burns was born on 1 April 1885 at St. Paul, Ramsey, Minnesota. She was the daughter of John L. Burns and Mary Eleanor Bramberry. Ann Elizabeth Burns married Samuel L. Anderson in 1913. 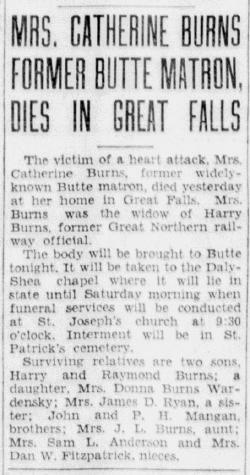 Ann Elizabeth Burns witnessed the death of Mary Eleanor Bramberry on 19 August 1937 at Butte, Silver Bow, Montana; Mary Eleanor Burns Obituary. 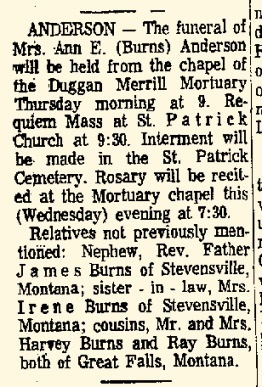 Ann Elizabeth Burns died on 10 November 1969 at Silver Bow, Montana, at age 84 Ann (Burns) Anderson funeral notice. She was buried on 12 November 1969 at Saint Patricks Cemetery, Butte, Silver Bow, Montana. 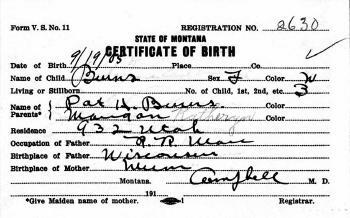 Ann Elizabeth Burns obtained US Social Security Card at Montana; last residence Butte, Silver Bow, Montana. She lived in 1945 at Butte, Montana. Name Variation James D. Burns was also known as Byrne. James D. Burns was born in January 1887 at Minnesota. He was the son of John L. Burns and Mary Eleanor Bramberry. 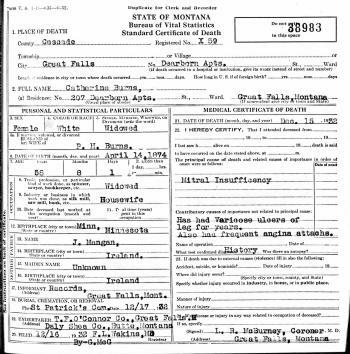 James D. Burns was the informant on the death certificate of John L. Burns on 4 April 1909 at from pnuemonia, Butte, Silver Bow, Montana; Many friends attended the funeral of John L. Burns, yardmaster of the Great Northern, who died Saturday night of pneumonia. The funeral was held at his home on South Dakota street yesterday morning, the body being taken to St. Patrick's church, where a high mass of requiem was celebrated by Rev. Father De Siere, assisted by Rev. Father Follett. The procession which followed the body to the grave was a long one and the floral offerings were so numerous that a special flower carriage was in the procession. The pallbearers were all old-time friends, and included Michael Angello, Armmett Womack, William Hoolihan, Martin McManus, Edward Keene and Charles McCormick. 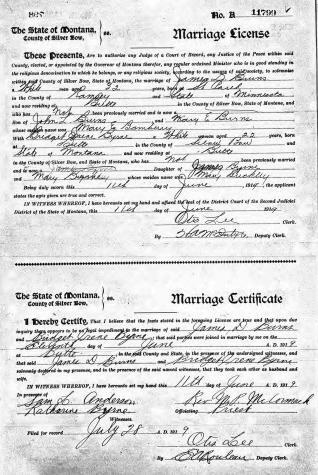 James D. Burns married Irene B. Byrne, daughter of James Byrne and Mary Ann Buckley, on 11 June 1919 at Butte, Silver Bow, Montana, Marriage license and certificate of James D Burns and Bridget Irene Byrne. 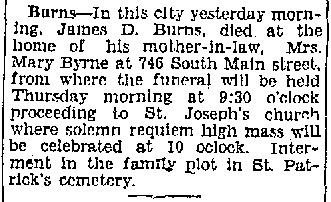 James D. Burns was buried in May 1929 at St. Patrick's Catholic Cemetery (located on South Montana Street), Butte, Silver Bow, Montana. 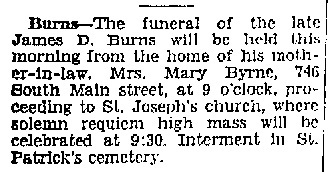 He died in May 1929 at at the home of his mother-in-law, Montana, at age 42 James D Burns obituary. (?) Bradley married (?) Crewes. John M. Ridgway was born on 29 January 1760 at Virginia. He was the son of Captain John Ridgway and Charity Hendrick. Part of his Dad's regiment. Henry Ridgway was born in 1765 at Virginia. David Ridgway was born in 1770 at Virginia. Married Name Her married name was Ridgway. Catherine Atwood married Samuel Ridgway, son of Captain John Ridgway and Charity Hendrick, at South Carolina. Catherine Atwood was born on 23 October 1762. George Washington Ridgway was born on 23 October 1803 at South Carolina. He was the son of Samuel Ridgway and Catherine Atwood. George Washington Ridgway married Hannah Wolcutt on 22 December 1822 at Pike, Ohio. George Washington Ridgway died on 12 July 1881 at age 77. [S246] U.S. Federal Census 1880 U.S. Federal Census, by Ancestry.com, NA Film Number T9-1058 Page Number 115D. Name Variation Catherine Mangan was also known as Katherine. Married Name 24 April 1901 As of 24 April 1901,her married name was Byrne. Married Name 24 April 1901 As of 24 April 1901,her married name was Burns. Catherine Mangan was born on 14 April 1874 at Minnesota. She was the daughter of J. Mangan. Catherine Mangan married Patrick Henry Burns, son of Patrick Byrne and Anna Hullen, on 24 April 1901 at Ramsey, Minnesota. Catherine Mangan died on 15 December 1932 at at home, Great Falls, Cascade, Montana, at age 58 Catherine (Mangan) Burns obituary and death certificate. She was buried after 15 December 1932 at Saint Patricks Cemetery, Butte, Silver Bow, Montana. Catherine Mangan had 5 with 3 living in April 1910 children. [S243] U.S. Federal Census 1920 U.S. Federal Census, by Ancestry.com, ED15. Dwelling 105. [S250] U.S. Federal Census 1930 U.S. Federal Census, by Ancestry.com, ED10. Dwelling 416. Name Variation John Henry Burns was also known as John Harry. Name Variation John Henry Burns was also known as J. Name Variation John Henry Burns was also known as Byrne. Name Variation John Henry Burns was also known as Harry John. John Henry Burns was born on 15 October 1903 at Butte, Silver Bow, Montana. He was the son of Patrick Henry Burns and Catherine Mangan. John Henry Burns married Juanita Penland, daughter of Henry Barton Penland and Florence Cook, on 17 April 1933 at Great Falls, Cascade, Montana. John Henry Burns died on 8 July 1986 at Marion, Oregon, at age 82. John Henry Burns obtained US Social Security Card at Montana; listed as J. Burns; last residence Salem, Polk, Oregon. [S373] U.S. Federal Census 1940 U.S. Federal Census, by Ancestry.com, Year: 1940; Census Place: Great Falls, Cascade, Montana; Roll: T627_2214; Page: 4B; Enumeration District: 7-8. Name Variation Catherine Madonna Burns was also known as Madonna. Name Variation Catherine Madonna Burns was also known as Byrne. Name Variation Catherine Madonna Burns was also known as Donna. Married Name 2 July 1930 As of 2 July 1930,her married name was Wardinsky. Catherine Madonna Burns was born on 19 September 1905 at Butte, Silver Bow, Montana. She was the daughter of Patrick Henry Burns and Catherine Mangan. Catherine Madonna Burns married Eugene A. Wardinsky on 2 July 1930 at Great Falls, Cascade, Montana. Catherine Madonna Burns died on 25 November 1963 at Great Falls, Cascade, Montana, at age 58. She was buried after 25 November 1963 at Mount Olivet Cemetery, Great Falls, Cascade, Montana. Name Variation Thomas Raymond Burns was also known as Raymond. Name Variation Thomas Raymond Burns was also known as Byrne. 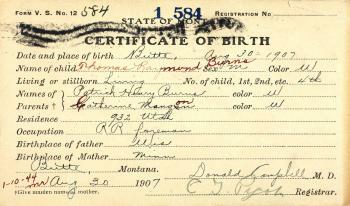 Thomas Raymond Burns was born on 30 August 1907 at Butte, Silver Bow, Montana. 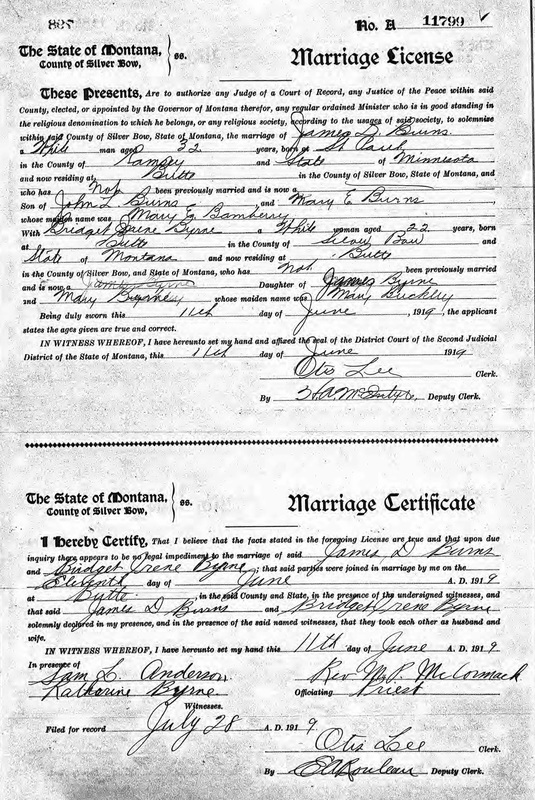 Thomas Raymond Burns married Viola B. Wooley, daughter of Francis Wooley and Hester Simon, on 22 February 1936 at Great Falls, Cascade, Montana. Thomas Raymond Burns and Viola B. Wooley were divorced on 1 August 1957 at Great Falls, Cascade, Montana. Name Variation James Burns was also known as Byrne. James Burns married Catherine (?). James Burns died before 1860. James Burns was born on 5 August 1834 at County Wicklow, Ireland, also reported as 1834 and 06 Aug 1835. He was the son of James Burns and Catherine (?). James Burns married Martha Connors, daughter of James Connors and Sarah Morton, circa 1867. James Burns died on 21 September 1917 at age 83 also reported as 21 SEP 1918. He was buried after 21 September 1917 at Saint Malachy Cemetery, Clyde, Iowa, Wisconsin. James Burns immigrated in 1854. [S248] U.S. Federal Census 1860 U.S. Federal Census, by Ancestry.com, Page 116. Dwelling 694. [S247] U.S. Federal Census 1870 U.S. Federal Census, by Ancestry.com, Page 19. Dwelling 121. [S246] U.S. Federal Census 1880 U.S. Federal Census, by Ancestry.com, NA Film Number T9-1429 Page Number 24B. [S245] U.S. Federal Census 1900 U.S. Federal Census, by Ancestry.com, ED58. Dwelling 190. [S244] U.S. Federal Census 1910 U.S. Federal Census, by Ancestry.com, ED51. Dwelling 1. Married Name circa 1867 As of circa 1867,her married name was Burns. Married Name circa 1867 As of circa 1867,her married name was Byrne. Martha Connors was born on 17 April 1850 at Highland, Iowa, Wisconsin. She was the daughter of James Connors and Sarah Morton. Martha Connors married James Burns, son of James Burns and Catherine (? ), circa 1867. Martha Connors died on 25 March 1925 at Iowa, Wisconsin, at age 74. She was buried after 25 March 1925 at Saint Malachy Cemetery, Clyde, Iowa, Wisconsin. Martha Connors had 8 with 7 living in 1900 children. She had 8 with 7 living in 1910 children. James Patrick Burns was born on 30 December 1870 at Wisconsin. He was the son of James Burns and Martha Connors. James Patrick Burns married Mary O'Neil, daughter of Patrick J. O'Neil and Mary N. (? ), circa 1901. James Patrick Burns and Mary O'Neil were divorced before 1920. James Patrick Burns died on 31 March 1951 at Iowa, Wisconsin, at age 80 James Patrick Burns obituary. James P. Burns, present sheriff of Cascade County, is a veteran Railroader and has been connected with the Great Northern Railway, with home and headquaters at Great Falls, For over twenty five years. He has also been interested in ranching, and is one of the most popular citizens of Cascade County, the best evidence of which is furnished in the fact that he was elected sheriff on the democratic ticket, in a nominally rebpublican stronghold of Montana. Mr. Burns was born on his fathers farm in Iowa County, WIsconsin, December 30, 1871, a son of James and Martha (Connars) Burns. His father was born in Ireland and died September 1918, at the age of eighty-two, while his mother is a native of Wisconsin and is still living. Sheriff Burns is the second in a family of four sons and four daughters. His father came to America when a young man by sailing ship, and was a pioneer settler in Iowa Co., Wisconsin. That district was then, new, raw and undeveloped, and he made a farm from the midst of the heavy timber and became widely known as a sucessful farmer and dairyman. He also was honored by his fellow citizens in local offices, serving as assesor for several terms. He was a loyal democrat and in religion a Catholic. James P. Burns recieved his education in the public schools of Iowa County, WIsconsin, until he was seventeen.. For several years after that he operated a threshing outfit, but in 1893, moved to St. Paul, Minnesota, and entered the train service of the Chicago, St. Paul, Minneapolis and Omaha Railroad. He came to Great Falls, Montana, in July 1895, and entered the employ of the Great Northern Railway, and for fifeteen years prior to the beginning of his duties as sheriff he was a railrway passenger conductor for that road. He is a member of The Order of Railway Conductors and has held an affiliation for twenty years. Mr. Burns was elected sheriff on November 5, 1918. He is affiliated with Great Falls Lodge No. 214 , Benevolent Order of Elks. For a number of years he owned a ranch of 480 acres in the Judith Basin. and made it a grain farm. He sold this ranch in December, 1917. James Patrick Burns was a Railroad Conductor in 1900. He was a sheriff at county jail in 1920. He was a passenger conductor for steam railroad in 1930. [S245] U.S. Federal Census 1900 U.S. Federal Census, by Ancestry.com, ED147. Dwelling 6. [S244] U.S. Federal Census 1910 U.S. Federal Census, by Ancestry.com, Sheet 1A. [S250] U.S. Federal Census 1930 U.S. Federal Census, by Ancestry.com, ED9. Dwelling 76. Name Variation Mary O'Neil was also known as O'Neal. Married Name circa 1901 As of circa 1901,her married name was Burns. Mary O'Neil was born in November 1882 at Illinois. She was the daughter of Patrick J. O'Neil and Mary N. (?). Mary O'Neil married James Patrick Burns, son of James Burns and Martha Connors, circa 1901. Mary O'Neil and James Patrick Burns were divorced before 1920. Mary O'Neil had zero children. [S245] U.S. Federal Census 1900 U.S. Federal Census, by Ancestry.com, ED144. Dwelling 81.